The correlation between extreme tides and the full moon was never anything I thought about when I lived on land. In Waterworld the drama of the day can be all about the Big Moon Floods. At my current dock during the last full moon the water crept over the embankment and soused the lawn. For a few hours there was a big puddle to jump to get into my gate. The marina kindly put down pallets to walk on. 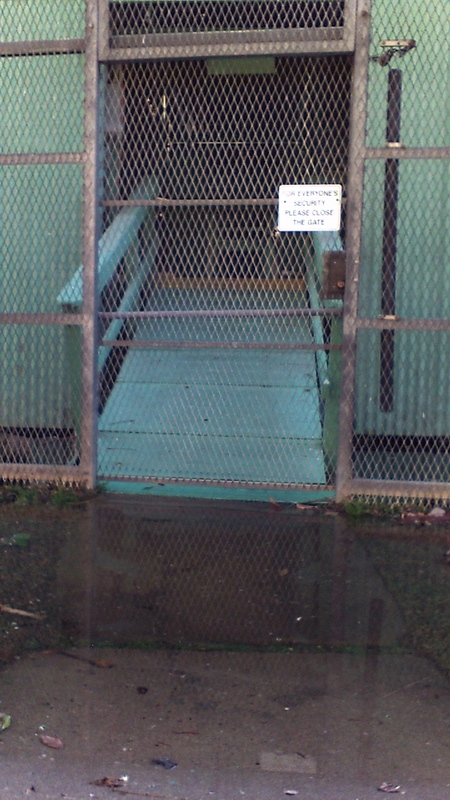 The ramp on the inside had flipped up and there was a 3′ drop to get down to the dock. Austin said it was no problem. He also approved of the new bunk extension I made so that the little bed hog would let me have some space. I made a cutout so he could walk underneath and stand between the salon benches to get his food and water. My boat has become a dog play area. This entry was posted on Wednesday, February 1st, 2012 at 7:33 pm and is filed under Boat Improvements and Cruising Life. You can feed this entry. You can leave a response, or trackback from your own site.